Jerry’s art is an original watercolor, now featured on this permanent sign at the Zoo. Okay, I admit it. I am a prideful wife. I can’t help it. Jerry is one of those Renaissance men who can do anything. For 40-plus years he was a brilliant orthopedic surgeon. He was an exemplary military man who worked his way up to become a Colonel. He has excelled in many sports, including football, paddling, racquetball, tennis – and he nearly shot his age in golf last week. He is Mr. Fix-it around the house. He loves to drive, and even manages foreign places with foreign languages on the signs. He has great taste and always chooses beautiful clothes and accessories for me. He makes a mean Green Chile Stew. And now he is a commissioned artist. He was asked to paint an image to go on the Honolulu Zoo’s Children’s Discovery Forest sign. It’s a lovely part of the zoo where indigenous plants are featured. 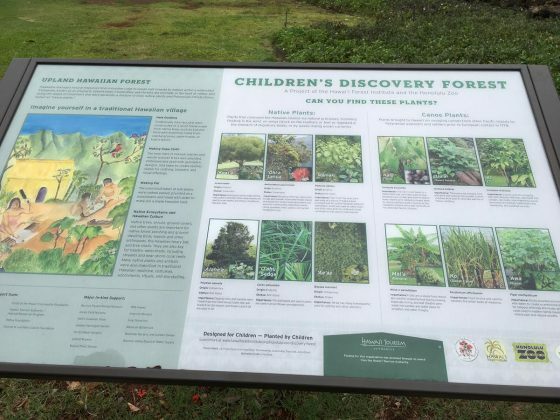 The sign offers educational opportunities for the keiki. He added a human touch to the painting, with a woman making kapa and a man pounding poi in front of their little hale. Painting a commissioned work is not easy, especially when it’s the first time working with a team on a first-time project with no history to guide you. 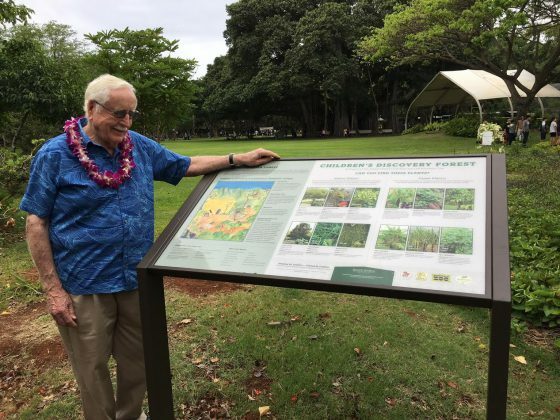 But he created a beautiful and lasting educational tool for the Honolulu Zoo.